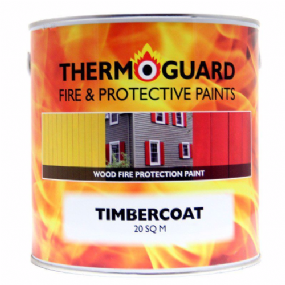 Thermoguard Timbercoat is a white Intumescent, fire retardant paint for bare or previously painted timber, wood & timber derivative surfaces where surface spread of flame and fire propagation need to be upgraded to Class 1 & Class 0 and or/ EN Class B.
Thermoguard Timbercoat can also achieve 30 & 60 minutes Fire Resistance. Thermoguard Timbercoat provides Low Smoke Emission and can be used inside and out, is low-odour and water-based, making it user and environmentally friendly. For 30 minutes or 60 minutes Fire Resistance, contact the our Technical Department on 0845 838 2225. BS 476 Part 6; Achieved – Pass Fire propagation.